Carrot cake is so underrated. Seriously, it’s such a delicious, moist cake that tends to be overshadowed by trendy flavours like red velvet. Don’t get me wrong, I love red velvet, and it was certainly one of our most popular flavours when I owned my bakery – but I wish people gave carrot cake another chance. Sure, it takes some extra work so it’s not exactly the laziest of recipes, but once you bite into that decadent cake with a dollop of rich cream cheese buttercream, it’ll all be worth it. If you haven’t guessed, it’s definitely one of my favourite cupcake flavours. 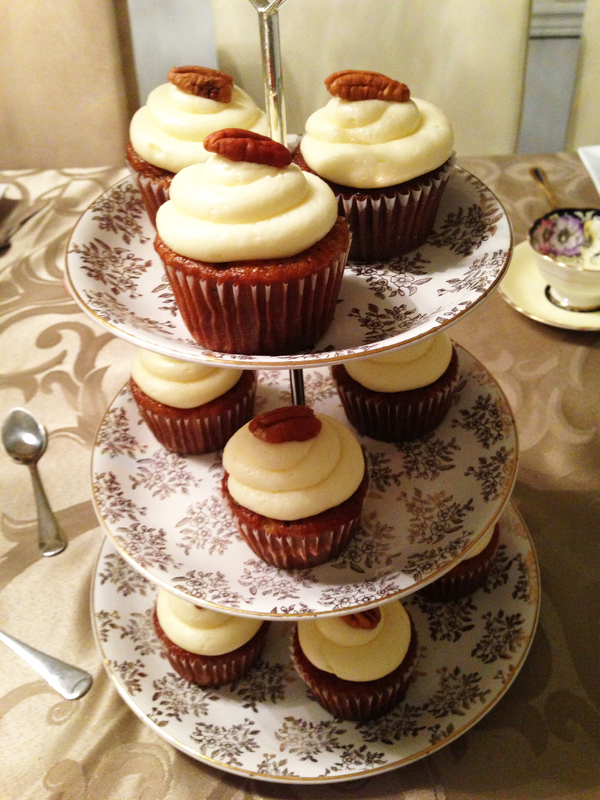 And this recipe is my go-to carrot cake/cupcake recipe. I’m also about to give you the secret to delicious, simple cream cheese buttercream – it was my ‘secret ingredient’ buttercream that deserves a post of its own (soon), and I think it’s time my friends. Time for you to be wowed. Preheat oven to 350 degrees F (175 degrees C). Prepare cupcake liners in cupcake tins. In a medium bowl, sift together flour, baking soda, salt and cinnamon. Set aside. In a large bowl, combine eggs, buttermilk, oil, sugar and vanilla. Mix well. Add flour mixture and mix well. In a medium bowl, combine shredded carrots, coconut, walnuts, pineapple and raisins. Using a large wooden spoon, add carrot mixture to batter and fold in well. Pour into prepared cupcake liners 2/3 full, and bake at 350 degrees F (175 degrees C) for about 25 minutes, or until a toothpick inserted into a cupcake comes out clean. Allow to cool for at least 20 minutes before frosting. Cream cheese buttercream is tricky in that it tends to become runny, it’s important to use full fat cream cheese, and actually mix the cream cheese, butter and icing sugar together at once (normally you’d add the sugar gradually, but in this case over mixing will lead to a runny icing). Make sure your butter and cream cheese are softened (room temp, not melted). Add the first three ingredients to your stand mixer and mix on low until combined (you can even mix with a wooden spoon at first to make sure the sugar doesn’t explode on you when mixing). Once the sugar is incorporated, you can add your vanilla and splash of lemon, and mix at medium/high until the icing is smooth. Again, make sure not to over mix. 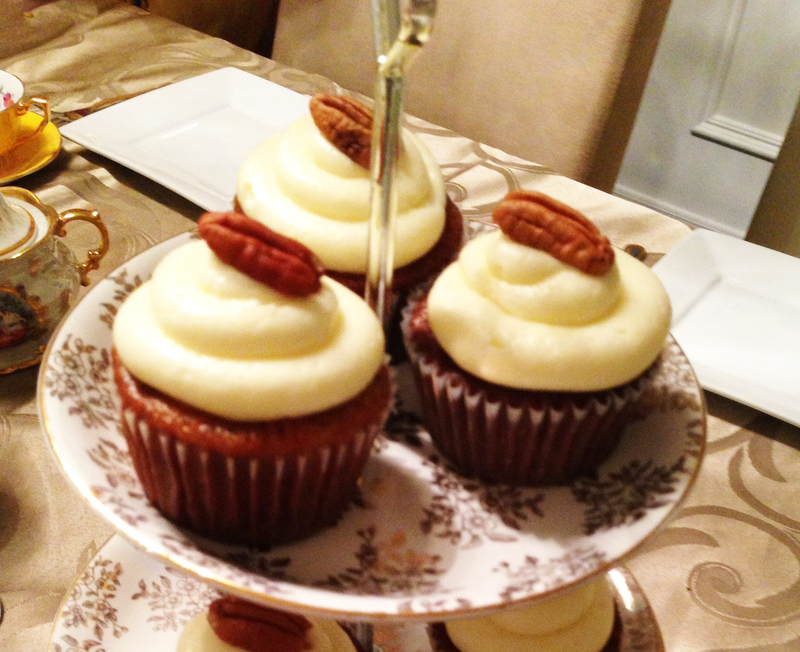 Frost your cooled cupcakes and top with a toasted pecan, if you wish. Normally, I like to keep cupcakes at room temp, but these bad boys can be refrigerated to keep the icing intact. Let them come to room temp before serving, though. Enjoy! Happy weekend! So as it turns out, it’s pretty tough to juggle work, a baby, cooking dinner every night, everyday chores, a bit of a life, and a blog – so I may not be able to blog as often as I had hoped. The good news is, my recipe match-ups can be found at flyerland.ca every single day. Yes, you heard me right – 5 days/week of lazygirl recipes – and, if you’re in Canada, I even match up each recipe with grocery items on sale that week. Check out my lazygirl section here. Ok, now that you’ve all forgiven me, I can move on with tonight’s recipe. I’ve been eating so much pizza since I started working again, it’s not even funny – from lunch & learns, to meetings, to nights when I don’t feel like cooking, pizza seems to be ever so present. The other night though, I decided to make a gourmet pizza at home. I used a ready-made pizza crust, but if you’re feeling extra ambitious, you’re welcome to make the dough yourself. You can also use fresh figs, but I couldn’t find any at my grocery store, so I used dried figs. Lastly, this recipe would also be great with arugula, but I decided to use spinach to make this pizza somewhat healthy. D loved it so much, he asked me to make a second one that night. Preheat oven to 425 degrees fahrenheit. 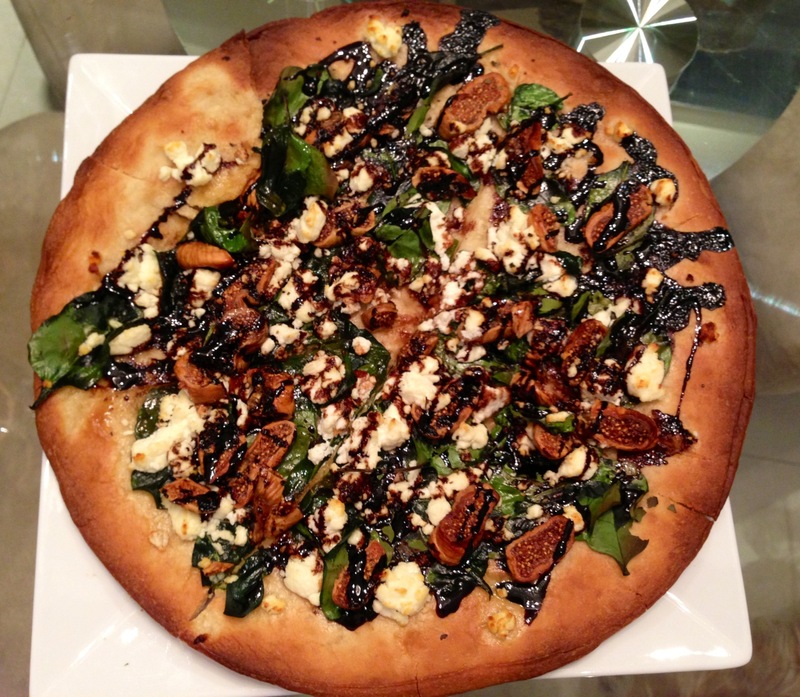 Brush pizza crust with olive oil, and cover with spinach leaves. 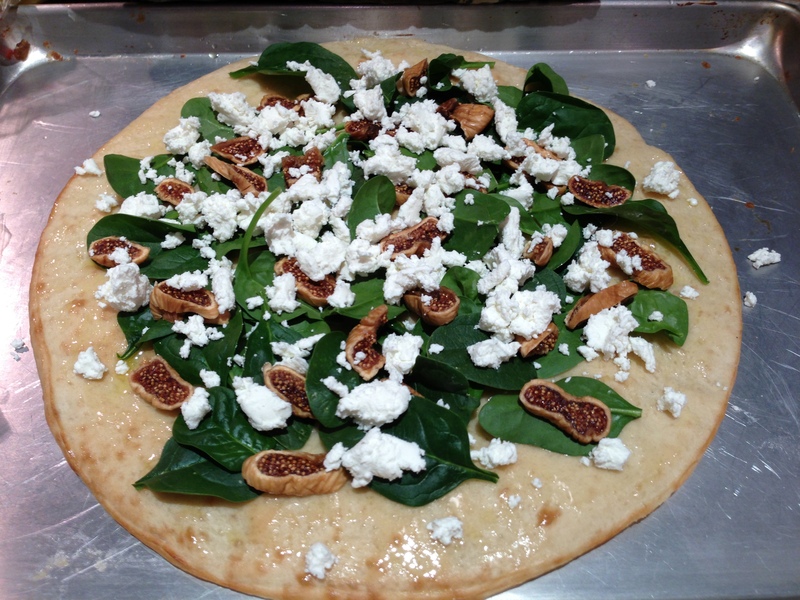 Add the fig slices and goat cheese (be generous with the cheese). Sprinkle thyme and basil over the pizza, then add salt and pepper to taste. Finally, drizzle with balsamic glaze. Place the pizza in the oven straight on the rack (no cookie sheet). Cook for about 10 minutes, then set the oven to broil, and broil for two minutes or until golden. Enjoy! Happy Friday! Quick post today with a few of my new recipe blog posts over at flyerland.ca. Click here for Cheeseburger Pie and here for slow cooker beef burritos. Both are totally delicious and easy. Enjoy! Happy New Year everyone! I know, I know. Where on earth have you been, Lazygirl? Well, after the torture that was the Dukan diet, I went on vacation for a bit, then the holidays came around, and then, I got extra lazy. But I’m back now, just as my mat leave is coming to an end. I return to work again next week, which will be a welcome change that I am looking forward to, but I’m also sad to be leaving Nate. The past 9 months have been incredible – just watching the little guy grow as well as having the time to explore new hobbies and interests. But, it’s time to get back to one of the other loves of my life – my career. For this reason, my recipes will have to be even easier and ‘lazier’ then before – something you can whip up quickly when you get home from work, or prepare the night before and throw in the slow cooker before you leave in the morning. Also, I’m not sure if I’ve mentioned this in the past, but I’m a huge hockey fan. So, the fact that the NHL lockout is over is pretty much the best news I’ve received all year (all 11 days of it). In honour of hockey being back, some of my recipes will be ‘game day’ inspired – ya know, wings and other yummy pub fare (that you can make at home). Anyway, have a fantastic weekend and I’ll be back with great recipes next week. I’m not gonna lie to you. This diet business is no fun. Sure, it was all easy and exciting the first week when the weight was falling off, and there were ‘so many options’ to make and eat. But this week, week 2, has been a different story. What I wouldn’t give for a double big mac combo with large fries…and a huge 5-layer chocolate cake for dessert. Yum. But I won’t. I will not give up. I refuse. Yes, my weight loss has hit a plateau. I’m down 8.4 pounds, but the scale has not budged since last Monday, except for a slight fluctuation of about .4 of a pound. 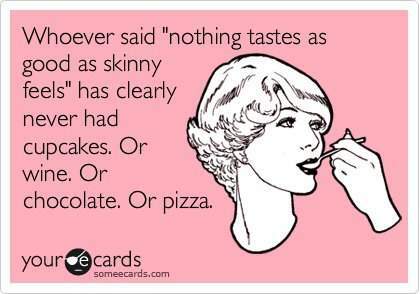 This, of course, discourages me and makes me want to say screw it, screw this diet and screw Dr. Dukan and screw sugar free, fat free everything. In reality, it’s really only difficult at night. You know, when D is chomping on bacon and sour cream chips and other such junk, and I’m sitting there with my sad little sugar free jello cup. For the record, I absolutely hate artificial sweeteners for the way they make things taste – artificial. I find it much more palatable to sweeten my own plain yogurt and whatnot with splenda, and add my own pure vanilla extract. So this, of course, makes snacking a lot harder. And I’m getting really sick of yogurt. And turkey. And smoked salmon. And eggs. And I could go on. So that’s pretty much it. I have no inspiring words of wisdom or encouragement. Just wanted to say that this is tricky. I won’t say hard, because there are so many other things in this life that are hard. But this is definitely not easy, let’s put it that way. Hi guys! So I know I said I would post some yummy Dukan recipes, but the problem is, I’ve made a bunch now and I’m yet to find something Lazygirl-worthy. I’ve made the standard meatballs and sticky chicken and they were okay, palatable I suppose, but nothing magnificent. The other day, I was craving something sweet and thought I’d make a Dukan brownie. It looked good enough but when I took a bite – yuck. So bad, I had to throw out the whole thing. The yummiest thing I’ve made and have eaten most breakfasts is the Dukan “pancake”, but I won’t post that since pretty much anyone on Dukan knows the recipe. In terms of progress, I do have to say that this is definitely the most effective diet I’ve tried. I’m on day 9, and I’m down 8 pounds. (Mind you, two of those pounds don’t really count, because I gained them over last weekend before I started the diet. It involved many a pizza slice and a Big Mac combo, but we’ll forget that ever happened). So in real pounds, lets call it 6. Not too shabby. 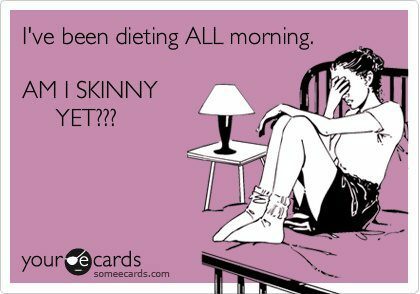 Now, if any of you out there have a good Dukan recipe to try, please share with me – I’m so bored of everything already. I’ll post some more progress reports soon! I’m so sorry I haven’t posted in a bit, but it’s been a bit difficult to cook delicious things when I’m on a super strict diet 😦 Since I couldn’t get rid of these last 10 pounds of baby weight through eating healthy and exercising, I decided I needed something more structured. My mother in law told me about a diet that she’s on called the Dukan diet, which is apparently huge in Europe, so I figured I’d check it out. It’s pretty strict, but doable. I’m going on day 5, and have lost 4.2 pounds – mostly water weight but still encouraging. There are tons of yummy recipes that go along with this diet, so if anyone’s interested, I can post them as I go. 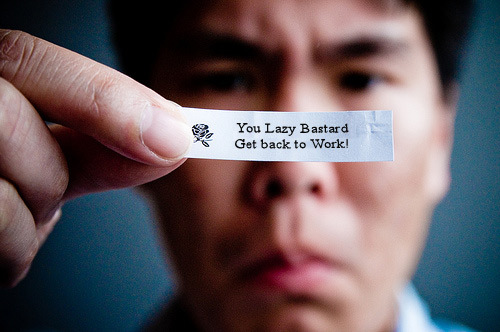 Otherwise, I’ll be back as soon as I start eating normally again!